Background: Dysphagia affects one in twenty-five adults yearly in the United States. Objective: While dysphagia may be common, the prevalence of dysphagia may be underestimated primarily due to under-reporting. Dysphagia may be caused by intraluminal, intrinsic, extrinsic, or motility disorders. Method/Results: We present a case of dysphagia caused by extra-thoracic extrinsic compression due to bra use. Conclusion: Despite many published reports on dysphagia caused by other diagnoses, we occasionally overlook extrinsic abdominal compression as the cause for dysphagia. 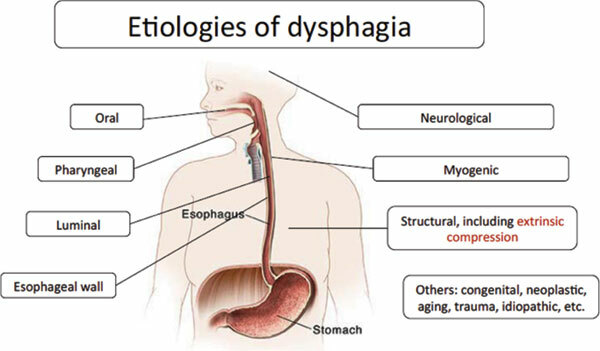 Dysphagia, dyspepsia, extrinsic compression, abdominal compression, esophageal spasm, esophageal manometry.